R Rohilla, A Devgan, N Magu, A Gulia, R Siwach. A Simple Technique For Removal Of Incarcerated Screw With Damaged Head: A Case Report. The Internet Journal of Orthopedic Surgery. 2006 Volume 7 Number 1. A simple technique for removal of an incarcerated screw with damaged head is described. A jumbo cutter is used to create indentations in the outer surface of the screw head and rotating the screw out. The method allows the surgeon to complete the prescribed procedure without weakening of the bone structure and stability of the fixation. The technique is simple and effective and can be used in peripheral hospitals where advanced gadgetries may not be available. Intramedullary interlocking nailing is a standard procedure in the management of diaphyseal fractures of the long bones. The interlocking screw head may get stuck while insertion, whereby repeated and forceful attempts to screw it in or to take it out with a screwdriver invariably causes the screw head of interlocking screw to become blunt and damaged. In other words the hexagonal slot in the screw head becomes rounded causing the screw driver to become free in the screw head. The surgeon can thus be left with a protruding screw that he is able neither to extract nor insert further into the bone. Removal of screws with damaged and stripped heads is extremely difficult if an instrument set for damaged screws removal is not available. The method the authors describe here allows the surgeon to easily remove such incarcerated screw with simple instruments at hand and complete the prescribed operation. A 29 year old laborer was involved in a road traffic accident and was admitted with segmental fracture shaft of femur. The fracture was classified as type AO 32 C2.3 as per AO/ASIF classification. Fixation with interlocking nail was planned on the same day. 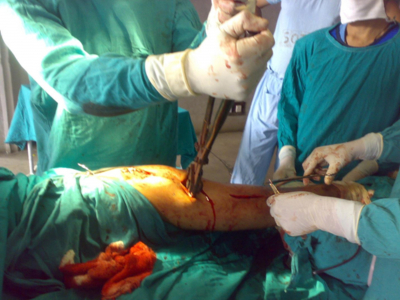 The patient was operated in lateral decubitus position. An oblique skin incision starting from the proximal tip of the greater trochanter and continuing proximally and medially for 6 cm was made. The fascia of the gluteus maximus was incised in line with its fibres. Piriformis fossa was palpated and entry portal for the nail was made with a curved bone awl. Guide rod was inserted till the distal end of the femur after close reduction of the two segmental fractures. An interlocking nail of size 40 cm X 11mm was inserted after appropriate reaming. Distal interlocking was completed with free hand technique. Proximal interlocking was attempted using proximal interlocking jig. Interlocking screw was inserted after prior drilling and tapping. The screw got incarcerated midway during the insertion. Forcible and repeated attempts to further drive the screw in with the screw driver led to the screw head becoming free, in other words the hexagonal slot in the screw head became rounded. We were left with a protruding screw inserted halfway in and engaged in near femoral cortex (Fig. 1). A damaged screw removal set was not available in the hospital. The stab incision was extended further to 3 cm. The usual pliers and T handle were tried but were not helpful in rotating the screw out. A jumbo cutter was used to impinge and make indentations in the outer surface of the screw head (Fig. 2). The jaws of the jumbo cutter were then fitted into the indentations made. The screw was rotated anticlockwise with the long lever arm of the jumbo cutter. Uniform impinging force needed to be maintained while rotating the handle of the jumbo cutter. This required alternate change of hands between the surgeon and the assistant standing on the opposite side of the operating table during one rotation of the arms of the jumbo cutter (Fig. 3 & 4). The damaged screw was removed with this technique without difficulty and the procedure was completed with another interlocking screw. Patient did not develop any postoperative complication. The incarceration of an interlocking screw is an unpredictable and delicate situation, which needs careful technique for removal. A damaged screw removal set may not always be available. Different techniques have been reported in literature to remove screws with damaged heads 1, 2, 3, 4. Termanini and Schildhaus reported a method for removal of screw with blunt head embedded in plate. They advised drilling a hole in the head of the screw, leaving a relatively thin rim, which could then be easily squeezed permitting delivery of the plate. The collapsed stump of the screw projecting above the surface of the bone was then removed with extraction pliers 1. 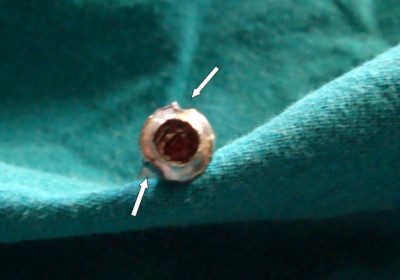 Moehring et al described a method for removal of incarcerated cannulated screws with the help of a Steinmann pin and T- handle chuck 3.Wu et al 5 advocated withdrawl of nail slightly to release the incarcerated broken screw end and then pushing out the screw end with Knoweles pin or a small screw driver. We encountered a different problem in the form of incarcerated interlocking screw which could not be removed with usual available extraction pliers and T handle because of the slippery round outer surface of the screw head. The jumbo cutter creates two diagonally opposite indentations on the outer surface of the head of the screw. The jaws of the jumbo cutter snugly hold the screw at the indentations. The long lever arm of the jumbo cutter requires minimal force for rotating the screw anticlockwise. This is the advantage over using a Vice grip or locking pliers which come with short handles hence a short lever arm thereby increasing the force that is required for twisting out the screw head. This method does not strip the periosteum any further. There is no risk of further comminution at the bone screw junction. The technique is simple and effective and can be used in peripheral hospitals where advanced gadgetries like damaged screw removal set may not be present. The disadvantage of the method is minimal extension of the incision, which is not of much significance. The reason of screw incarceration in our case could be slight loosening of the proximal interlocking jig, maybe due to persistent hammer blows. Perhaps the most important precaution for the surgeon is to retighten the proximal locking jig into the proximal end of the nail so as to ensure that there is absolutely no play between the jig and the nail before commencing the proximal locking. This holds true for distal locking jig, if used. This simple precaution will prevent any offset between the hole drilled in the cortex and the hole in the nail thereby avoiding any chances of screw getting stuck while inserting. Other than that care must be taken that the screw advances steadily and uniformly with each rotatory movement of the screw driver and to stop screwing any further if the screw shows no sign of progression or undue resistance. Drilling and tapping of the hole should be adequate. These precautions if taken will avoid any blunting of the screw heads. 1. Termanini ZA, Schildhaus AIE. A simplified method for the removal of screws with damaged heads. J Bone Joint Surg (Am) 1979; 61A:631. 2. Bhutta MA, Dunkow PD, Lovell ME. A simple technique for removal of screws with damaged heads. Ann R Coll Surg Engl 2003; 85(3):207. 3. Moehring HD, Althausen PL, Lindholm SR. 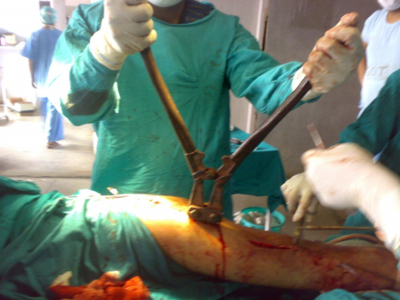 Technique for removal of cannulated screws. J Orthop Trauma 2005;19(4): 280-1. 4. Deogaonkar K. Screws with blunt heads. Ann R Coll Surg Engl 2006; 88(6):607. 5. Wu CC, Lee ZL. 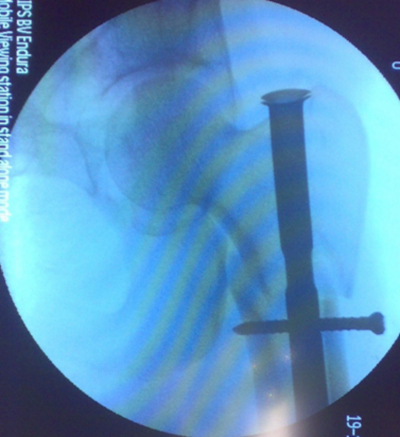 Treatment of femoral shaft aseptic nonunion associated with broken distal locked screws and shortening. J Trauma 2005; 58(4): 837-40.